Like others in the natural health community, our Foundation has long realized that Wikipedia functions as a vehicle to influence and control public opinion worldwide. As we have learned over the years, any positive scientific information on natural health approaches that gets posted on the online encyclopedia is quickly removed. 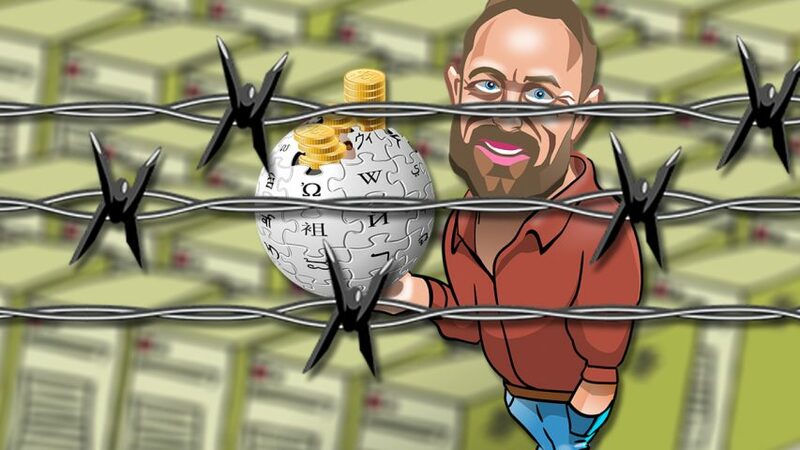 If you’ve ever wondered where this dictatorial policy ultimately comes from, you need look no further than Wikipedia’s founder and self-styled “spiritual leader”, Jimmy Wales. What we won’t do is pretend that the work of lunatic charlatans is the equivalent of “true scientific discourse”. The implicit message here is that only “lunatic charlatans” practice or advocate non-orthodox forms of medicine. Seemingly, Wales wants us to believe that studies using natural health approaches are not published in “respectable scientific journals”. However, while we would fully agree that not all forms of alternative medicine are as scientifically-based as the Cellular Medicine approach, the evidence clearly shows that Wikipedia refuses to make mention of such studies even when they exist. 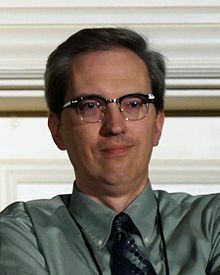 David H. Gorski – a surgical oncologist from the United States who uses the name ‘MastCell’ – removed numerous links to Dr. Rath’s scientific studies from Wikipedia. Gorski is a Wikipedia Administrator and has special editing rights. Between February 2008 and April 2009, aided by some willing assistants, we attempted to correct some of the key factual errors and blatantly biased statements in the Wikipedia article on Dr. Rath. It proved to be an eye-opening experience. On many occasions our efforts were reversed within hours – and sometimes within minutes. This was even the case when our edits were completely consistent with Wikipedia’s core rules. For a while, we did succeed in having some mention made of the numerous studies that Dr. Rath and his research team have had published in peer-reviewed scientific journals. However, after being reduced to one single PubMed link by David H. Gorski, a surgical oncologist from the United States who uses the name ‘MastCell’ on Wikipedia, all remaining mention of Dr. Rath’s scientific work was eventually removed entirely by Alex Brown, an IT professional connected to the UK government. Apparently, Wikipedia’s web visitors are not allowed to know that Dr. Rath has coauthored over 100 scientific studies published on the US National Library of Medicine’s PubMed site. Worse still, it would seem the main goals of Wikipedia’s article about him are defamation and outright character assassination. 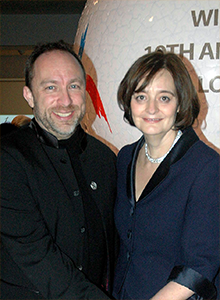 Cherie Blair, wife of former UK prime minister Tony Blair, joined Jimmy Wales at a celebration of Wikipedia’s 10th birthday. 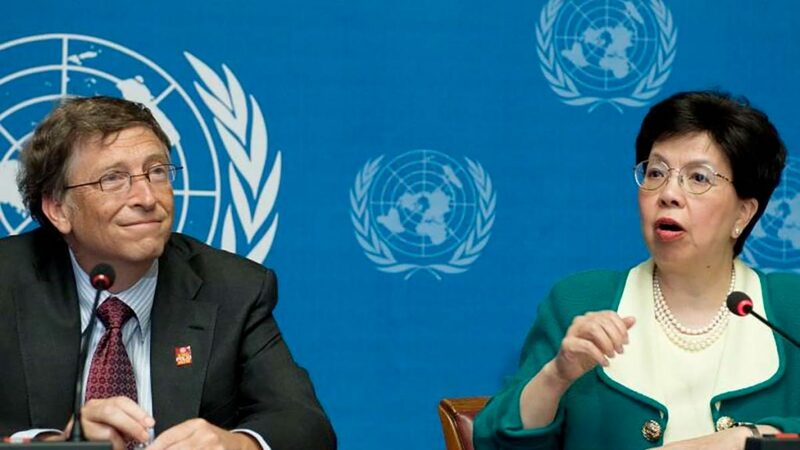 There’s an old saying that you can tell a man by the company he keeps. In the case of Jimmy Wales, the circles he now moves in are particularly revealing. His wife is Kate Garvey, who formerly worked in the private office of war criminal Tony Blair during the years he was UK prime minister. Notably, therefore, both Blair and his political operative Alistair Campbell were prominent guests at Wales’ and Garvey’s wedding in 2012. A regular attendee at the World Economic Forum in Davos, Switzerland, Wales’ introduction to the annual gathering of the global financial elite came as a result of his receiving a personal invitation from Irish musician and ARV drug promoter, Bono. Over the years, attending international meetings in Davos has given him direct access to the likes of Bill Gates and other multibillionaire pro-pharma investors. Seen in this light, it isn’t difficult to imagine where his opposition to natural health approaches may stem from. To many of the people Wales is hanging around with these days, free access to the sum of all human knowledge clearly has strict limits. That he now openly admits this in relation to Wikipedia’s treatment of natural health information speaks volumes.